July 4, 2016 – On this Independence Day, our time machine takes us out to the ball game, on a July 4th neither side of the Revolutionary War could possibly have envisioned during the conflict. The place is Chelsea, England. The time: The Great War. 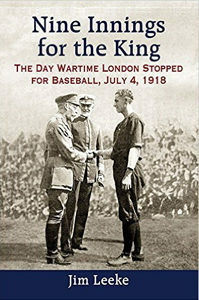 The book is titled, Nine Innings for the King: The Day Wartime London Stopped for Baseball, July 4, 1918 . We’ve chatted previously with today’s author, Jim Leeke, about his Civil War novel for young adults: Matty Boy . Jim is a contributor to the Society for American Baseball Research Baseball (SABR) Biography Project, the writer or editor of several books on U.S. and military history, and the creative director of Taillight Communications. We’ll also be hearing about the Anglo-American Baseball Project. It’s an ambitious plan to recreate the King’s Game for its centennial: July 4, 2018. Pitch in to help at AABaseball.org, or by following Jim @9Innings4King on Twitter. For more on baseball players in the Great War, enjoy our interview with Charles Leerhsen, author of the award-winning, Ty Cobb: A Terrible Beauty. Cobb — the victim of malicious slander falsely depicting him as a selfish, belligerent racist — not only signed up to serve his country, he enlisted in the dangerous chemical warfare unit rather than a cushy behind-the-lines job. In the aftermath of the Brexit vote, the special relationship between the United States and Britain as trading partners will have real-world impacts on millions of people around the globe. In a small, early way, the King’s Game started us off then, to where we stand now, shoulder to shoulder in good times and bad, with George Washington honored with a statue in London, gazing straight at the Parliament against which he rebelled.